New Green Hurst - This is the home and hunting ground of the elves during the warm season. 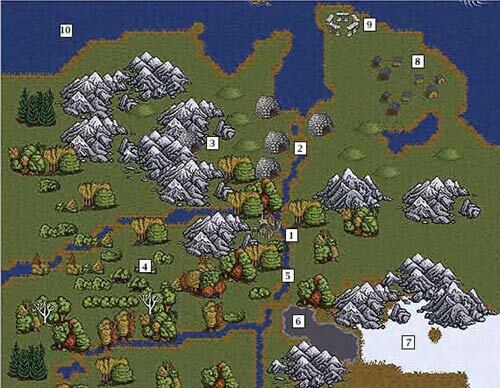 Main sources of food include game from the nearby Talldark forest and from the plains near the Everfrost. White Cold Dwellings/Storage - Because winters at Stormrise can be quite bitter, these caves are the homes and storage areas of the Stormrise Holt elves during the White Cold season. The southernmost caves are used for food storage, while the northernmost are dwellings. Griffin Aerie - Where the griffin-mounts of the Stormrise griffin riders rest and nest. Though the elves knew of the griffins for ages, it was Wren who first visited the aerie when she bonded with the beasts. Talldark Forest - Hunting ground for both the Stormrise Holt elves and the holt's wolves. Game here includes treehorns and bears, and the forest is also a fertile growing place for dreamberries and other plants of sustenance. Lifegiver River - The elves' main source of fish and fresh water during the green months. The river is very wide and rapid in places, and easily crossed at others. Howling Winds Canyon - This huge chasm marks the borders between the plains and the Everfrost. Elves often travel here in the warm months to hunt bison and elk. Everfrost - Not much is known about the Everfrost other than it it an inhospitable place. Elves who have ventured here have never returned. Snowbears and other strange creatures dwell here. Human Fishing Camp (Iasc) - The camp with stone buildings has only recently been discovered by the elves. It is unknown if the humans stay past the warm season or not, but the fish the humans find here are a main source of their food. Standing Stone Ring - Built by a human priest, its true function is unknown to the elves. Muchcold Water - A source of food (fish) to both elves and humans. It is a large sea, however, and not even the elves on griffin mounts have been able to find land past the pounding shores.